Attorney - All - Ackley, Thomas F. Beaufait, Teresa A. Brugman, Helmut E. Burbach, Max J. Burkman, Nathan T. Buske, Eric Cammack, Taylor A. Christensen, Roberta L. Cockerill, Adam L. Cox, Michael C. DeLuca, Anthony P. Dieckman, Taylor C. Dunn, John C. Fraczek, John D. Gade, Paige E. Goeschel, David A. Grattan, Stephanie A. Hamm, Brandon D. Harr, Brian L. Herbers, Benjamin G. Herian, Minja Hershiser, Margaret C. Hiatt, Mitchell D. Hoffman, Elizabeth A. Huigens, Joseph Hupp, Michael M. Jung, Emily L. Kay, Robert A. Keblesh, Michael J. Koehn, Leigh M. Koenig, Brian J. Krueger, Kristin M. Langstaff, Casandra M. Lehan, Lisa M. Lesiak, Nicholas F. Linder, Michael J. Lingelbach, John M. Lofgren, Marlon M. Maser, Matthew D. McGaughey, M. Shaun McMahon, Daniel M. Medill, Colleen E. Murow, Daniel S. Norton, Joshua K. Oxley, Eric B. Pasricha, Anshu S. K. Piatek, Justina A. Rupiper, Zachary M. Scaglione, Gregory C. Schaffart, Jeffery R. Seals, Tyler S. Sevcik, Ryan J. Sharif, Comran E. Shuler, Karen M. Speiker, Matthew J. Stokes, Alyssa M. Swanson, Donald L. Tews, James A. Tjaden, Kurt F. Vroman, Richard D. Ward, Julie A. Wolf, Alexander J.
Bryan Slone, Of Counsel and Chair of the Tax Practice at Koley Jessen, has been selected as the next President of the Nebraska Chamber of Commerce and Industry (“Chamber”). What Does Tax Reform Mean For You and Your Business? Koley Jessen is proud to announce that eight attorneys received individual rankings in the 2017 Chambers USA Guide. Koley Jessen recently hosted 130 accountants, investment advisors and insurance brokers at the Estate Succession and Tax Summit at Happy Hollow. Congratulations to Patrice Ott, who has been promoted to Shareholder as of January 2017! Congratulations to Anshu Pasricha, who has been named a 2016 Midlands Business Journal 40 Under 40 award winner. Koley Jessen is pleased to announce that Michael Keblesh has joined the firm as an Associate. Koley Jessen has welcomed former law clerk, Justina Piatek, to the firm as an Associate in the Business General Counsel Practice Group. Formerly a law clerk with Koley Jessen, John Dunn has returned to the firm as an Associate. 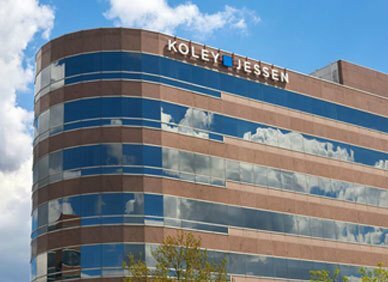 Koley Jessen Represents JBT Corporation in Acquisition of Stork Food & Dairy Systems B.V.